If at first you don't succeed, please leave a message after the tone. Recently, a desire to roam around London took me to a previously inaccessible part of town. The Thames. Of course, there have been ways of travelling up and down the Thames for a long while but i'd never quite thought about taking a tour of it. So, after a short trip to Westminster, I boarded one of many boats in the Thames River Services fleet and began my journey. After taking a seat on the upper deck (outside) the passengers were met by a friendly and commanding cockney-accent oozing through the boat's P.A. (Public Address) system. The voice spoke throughout the trip confiding knowledge of the river's history, current affairs, and occasional well-placed humour in the passengers. My trip was to Greenwich, although the boat also travels from Westminster to the Thames Barrier which will take you underneath the new cable-car being built for the Olympic Games. Much of the history of London is centred around the Thames; old unused warehouses that once drove the British economy have now become luxury apartments, the locations of scenes used by famous writers such as Shakespeare and Dickens are scattered across the shores of the Thames. I won't mention too much of the history otherwise I may spoil the trip for you which is, in itself, incredibly soothing. The Thames seems to have a rhythm to it that relaxes you completely; some of the boats provide bars on the lower decks and all have toilets as you may expect. After disembarking in Greenwich I spent a couple of hours looking around at other historical features as well as helping myself to some lunch in the nearby pub. 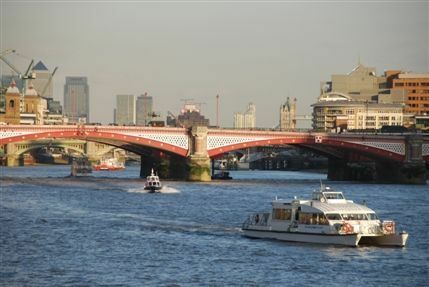 When I felt like returning I simply hopped on the next boat (Available every 30 minutes) and relaxed again as the sights of London washed over my eyes. The guides or speakers of the boats are volunteers and don't get paid for their efforts, which are incredibly insightful and make the trip more than just a ride on a boat, so at the end of your trip you may donate anything you wish if you do so desire (there's no pressure to do so, so don't feel as if you must). Overall, the trip is brilliant; a great way to spend a few hours in London. It's also very affordable with a trip to Greenwhich costing £13.50 for an adult return ticket or £6.50 for a child return ticket. If you want to travel all the way to the Thames Barrier just add £1.50 to that price. Boats come once every half an hour making them easily accessible so you have time to take care of anything else you might need. I'd strongly urge anyone looking for an enjoyable trip or even an enjoyable way to travel as it is very family friendly and, only taking between 45 minutes to an hour to reach your destination, it won't eat up your day!